This updated system used a new type of remote control in place of Terminal 5000: the Audio Terminal or AV Terminal. A new Master Control Panel was introduced, recognisable by its rotary sound control. These changes meant that the Beomaster made to be extensively re-designed, and now also included Speaker Link sockets for use with active loudspeakers. Beocord 5500 was also all new, and featured auto reverse and automatic/manual recording level control, which could be monitored and adjusted from Master Control Panel 5500. The Beogram 5500 was little altered from the previous 5005, whilst the Beogram CD 50 remained unchanged. The Beomaster’s new Speaker Link sockets meant that the best use could be made of the new Beolab Penta active loudspeakers, whose LCD displays showed the status of the system. Text copyright © Beocentral. Unauthorised reproduction prohibited. 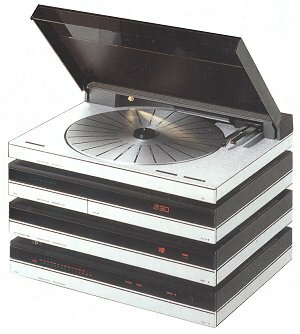 Late 1987: Beogram CD 5500 replaces Beogram CD 50: An all new compact disc player, the Beogram CD 5500, was the main change in the updated Beosystem 5500. To keep the system neat, it looked almost identical to its predecessor from the outside, but a new slimmer drawer on the right (as opposed to the left) of the machine gave the game away. A more subtle change was made to the second, smaller terminal, which replaced the A/V Terminal, and was called Beolink 1000. The Audio Terminal was by now deleted. Text copyright © Beocentral. Unauthorised reproduction prohibited.